“ ..lifts the lid on the catastrophic mistakes that led RBS to the brink of collapse, scrutinizing the role played by RBS’s directors who failed to check Goodwin’s hubris, colleagues… politicians … and investors. Ian Fraser. Journalist, commentator and broadcaster. At its zenith, the Royal Bank of Scotland was the world’s biggest bank. It had assets of $3 trillion, employed over 200,000 people, had branches on every high street and was admired and trusted by millions of borrowers and investors. Now the mere mention of its name causes anger and resentment, and its former CEO, Fred Goodwin, is reviled as one of the architects of the worst financial crisis since 1929. 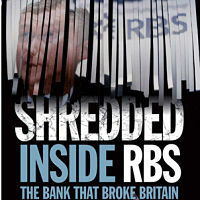 In Shredded, Ian Fraser lifts the lid on the catastrophic mistakes that led the bank to the brink of collapse, scrutinizing the role played by RBS’s directors who failed to check Goodwin’s hubris, the colleagues who were overawed by his despotic leadership style, the politicians who created a regulatory free-for-all in which banks went virtually unsupervised, and the investors who egged Goodwin on. As more and more toxic details emerge about the bank’s pre- and post-bailout misconduct, which stretches from the ruination of numerous small businesses in the UK and Ireland to the criminal fiddling of Yen Libor, and from the alleged manipulation of global foreign-exchange markets to the wholesale ‘mis-selling’ of US mortgage bonds, Ian Fraser examines what the future holds for RBS and whether it can ever regain the public’s trust. Bill Jamieson, The Scotsman, 11 December 2014.